When I read about bridges lasting centuries or even millennia it makes me wonder if they are still usable and at what cost? Caltrans bridges need constant attention to keep them in service and after about 75 years they usually need to be replaced. People praise the longevity of the Roman bridges, but the ones I've seen could never carry modern highway traffic. The existing Antlers Bridge is a five span deck truss on pier walls that was built in 1941. After 75 years the bridge can't carry all the traffic on I-5 and the floor beams and deck stringers suffer from fatigue cracks. Interestingly, the trusses haven't had a recent inspection because the deck is on a 8% superelevation, which prevents the snooper (UBIT) truck from extending its arm under the bridge. Because the existing bridge will be torn down in 2016, another inspection of the truss won't be needed. 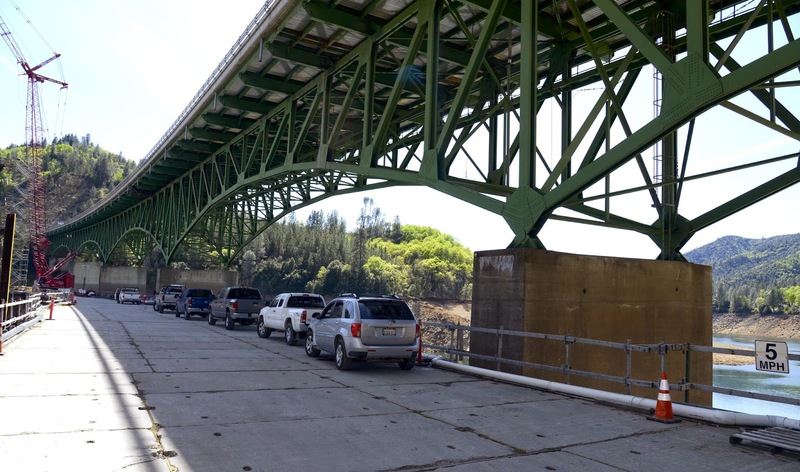 Caltrans typically has meetings with the community to reach consensus on bridge replacement projects. This can be a long process. An old timber bridge in Albion, California needed to be replaced but the community was quite attached to it. The New York Times wrote an article recently about the politics of replacing that bridge. When the talk was on replacing the Antlers Bridge, the community was hoping that new jobs and new residents would help revitalize the community, but that never took place. We'll continue our discussion of the Antlers Bridges tomorrow. Shasta County, California Bridges: Antlers Bridges (3) by Mark Yashinsky is licensed under a Creative Commons Attribution-NonCommercial-NoDerivatives 4.0 International License.